This is what I do in the final half term of Wider Opportunities Djembe classes. Each step happens as part of a lesson. 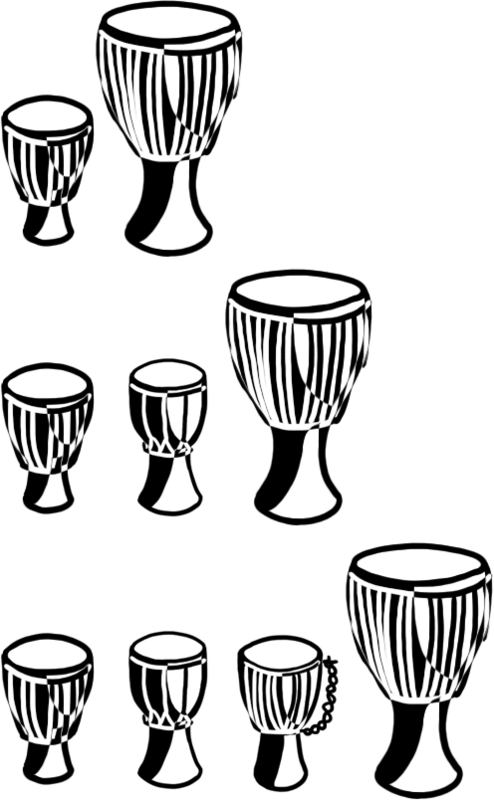 Introduce (or revisit) the idea of using phrases to create djembe rhythms. I just look around the room I am teaching in for inspiration – for example, a notice board headed with a topic like “Rivers and Mountains” provides as good a starting point as any – say the phrase a couple of times to decide upon the rhythm, and then play it using tone and bass sounds. “I can use capital letters”. “Core value – creativity”. These are all phrases I have seen and used. Or use food: “I like eating pizza”. Then get the children to come up with ideas, and convert them to rhythms. Play them together using “listen and copy” to share them with the whole group. Step 2 Paper and pencils are a good idea – warn them against using the drum head as a table-top! Divide the children into twos or threes (depends on the size of the class) and get them to come up with a phrase, which they then convert to a drum rhythm. They should make a note of their rhythm using any kind of notation that works for them, and they need to be able to play their rhythm pattern four times in a row. Your job now is to go round the groups and make sure that they are all on track. After a suitable amount of time, everyone takes turns at sharing their rhythm. Combine two small groups together to make larger groups. Their challenge is to join their phrases together to make a more complex rhythm. They can take turns, or create layers, add or take away bits – it is up to them. make sure they write down their final ideas for next week. They must be able to play their new, enhanced, pattern four times in a row. Once again, you circulate to help them along, and once again you all listen to each group in turn. which everyone learns, and then each group supplies a different “verse”. You will need to practise getting every group to play and maintain the pulse, and some groups may need help (e.g. counting in). providing you have made sure that each group has at least one reasonably able player, this should work well, and you will have a whole class composition for your final celebration or concert. This entry was posted in Composition, Djembe, The organised teacher and tagged group composition. Bookmark the permalink.